First I was scared, now I'm petrified.. as I send in my validation.. wish me luck! Thank you everyone who voted and commented!! Broken down barns, I can't compete with thou.. or was it thee..
Oh, well.. I was really angry at something and I stormed out of the house with my camera. 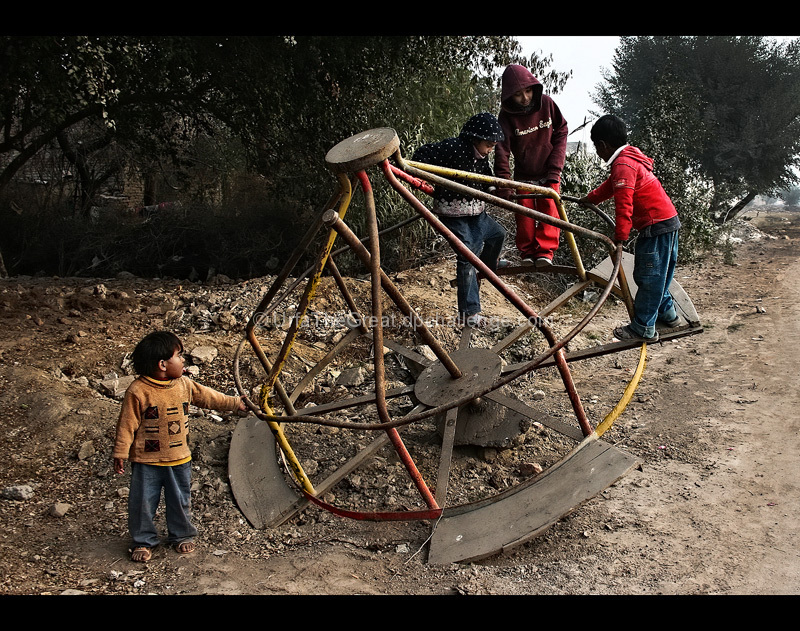 A kilometer or two later I got to my destination which was this broken merry go round type thing. I was busy taking pictures of this when these kids joined me. They live close by and got curious about me and my camera. They kind of crept in on the scene gradually.. I chatted with them.. took portraits, asked their names, had a ton of fun and then I walked back home. In this picture they're trying to straighten it for me so they were putting combined weight to roll it to the other side. Though they accomplished that eventually they forgot their main purpose and started playing around. It was a cloudy, foggy day so the colours and light were hard to achieve..
from left to right: Areeba, Isha, Umair and Dalawar. Congrats on the yellow. Quite the progress methinks. This made me smile. Congratulations! When I saw this pic....I knew it would do well. It captured my heart. kids dont play any more in the modern world..They collect dust behind computers and electronic games. They have become adults...Never content with what they have always looking at what they dont have or still want. Kids dont look at the obstacles. They create opportunities. Im so glad you could have fun with them. Great shot! Congrats on the yellow! Yay yay YAY!!!! I did not have time to look through this challenge - I am SO pleased that his did well! You have a lovely sense of the real world in your work. CONGRATULATIONS!!!! Urfa you are such a delightful photographer. Love, what you have captured here. It is very interesting when things unfold themselves before you, as happened these kids made the perfect scene and setting for you. A very well deserving ribbon too! Enjoy! Awesome Urfa!! Congrats on the ribbon! Excellent find, Urfa. What an interesting scene. Congrats on your second ribbon! Excellent. Love the image and the story. Many congrats on your well deserved ribbon. Congrats on the ribbon. Well deserved. One of my favorites in this challenge. It always amazes me that kids can make a toy out of everything. fantastic!! My only wish would be to crop in a bit tighter, but that could be difficult with this specific photo. I like the muted, yet still vibrant, colors in this. Does that even make sense? Also a very interesting subject, tells a story. Nice take on the challenge. One man's trash... Excellent capture - This totally brings back my childhood. Proudly hosted by Sargasso Networks. Current Server Time: 04/19/2019 12:43:56 PM EDT.